One of the Valleys lying hidden in the inaccessible depths of the Trans Karakorams is the Shaksgam Valley but thats not its real claim to fame. It is purported to be an integral part of the state of Jammu and Kashmir but under Pakistani control and has since been “ceded” to China by Pakistan as per the terms of their Border Settlement Agreement.It is also referred to as the Trans Karakoram Tract and the Tract has an area of almost 7000 sq km. And as soon as it became a part of China access and approach to it became much more complicated and has been out of bounds till the Chinese decided to open the Valley as it serves as a an alternative Basecamp from the North for the K2, the second highest Peak on the Planet. The Valley itself is around the Shaksgam River and as said before its bounded by the Karakorams in the South and the Kun Luns in the North. Its political status notwithstanding the Shaksgam valley is one of the most inhospitable places on the planet. 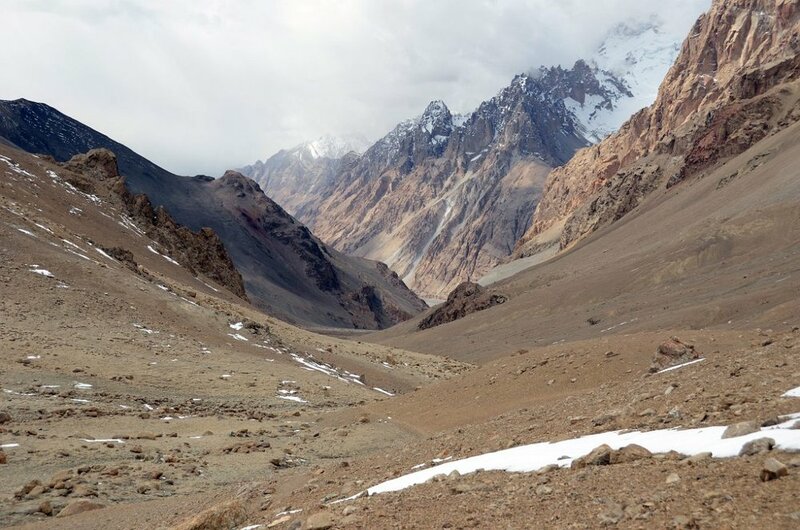 As mentioned one Passes through this Valley on the way to the North Base Camp of the K2 which is situated in the same Region and you descend into this amazing wilderness after crossing the Aghil Pass which serves as the Gateway to the Shaksgam Valley. The Shaksgam River itself is a tributary of the Yarkand River and hence the water ends of in the void of the Tarim Basin. The Shaksgam Valley was explored by sir Francis Younghusband once upon a time though he referred to it as the Oprang. Few Explorers had ventured into this Mountain wilderness before Younghusband. And then suddenly I come across an Article on one of the Most Travel Aggregator Sites which puts it as thus “If only this paradise was open for tourism, Shaksgam would have beaten Switzerland and Iceland as the most favoured exotic travel destination. The world is a beautiful place, and sometimes this beauty becomes the reason for conflict among admirers. Shaksgam is that enchantress who has been veiled.” Really ? Dude ? And of course it was accompanied by beautiful pics with Tall Pine Trees and Flowing Rivers. Quite unlike Shaksgam if I may mention. Eric Shipton and TG Longstaff, two of the greatest explorers of these Mountains of the Himalayan Complex went exploring in this Region and came up with their masterpiece “Blank on the Map: Pioneering exploration in the Shaksgam valley and Karakoram mountains. And it is described as such “As I studied the maps, one thing about them captured my imagination … Across this blank space was written one challenging word, "Unexplored"' In 1937 two of the twentieth century's greatest explorers set off to explore an unknown area of the Himalaya, the breath-taking Shaksgam mountains. With a team of surveyors and Sherpas, Eric Shipton and H.W. Tilman located and mapped the land around K2, the second-highest mountain in the world. It was their greatest venture, and one that paved the way for all future mountaineering in that area of the Himalaya. For Shipton and Tilman, exploration was everything, with a summit a welcome bonus, and Blank on the Map is the book that best captures their spirit of adventure. With an observant eye and keen sense of humor, Shipton tells how the expedition entered the unknown Shaksgam mountains, crossing impenetrable gorges, huge rivers and endless snow fields. There's a very human element to in Shipton's dealings with his Sherpa friends, and with his Balti porters, some of whom were helpful, while some were less so. The expedition uncovers traces of ancient cultures and visits vibrant modern civilizations living during the last days of the British Empire. Only when all supplies are exhausted, their clothes in tatters and all equipment lost do the men finally return home. A mountain exploration classic. Ill leave it at that. And add a pic of the Shaksgam Valley taken by Jerome Ryan a couple of years back.